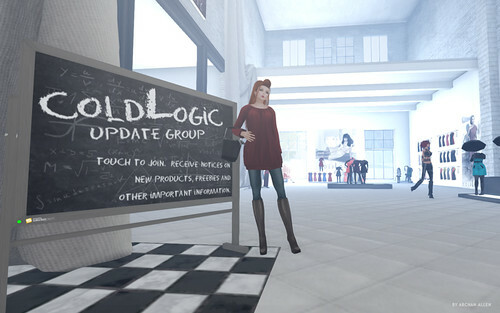 Today I came into a new store, coldLogic, full of high quality mesh items : dresses, pants, tops, sweaters, and… Coats ! And here the one I decided to buy ! If you join the suscriber, you’ll get a free dress pack ! I created some jeans, and here is one color I gift for Season’s Palette Hunt 2 ! It is hidden at Bounce mainstore (Hint : “The Mail should be hidding something”). The store looks really nice, in and out. My new coat ! I love it ! The shopping basket is actually the box that contains the items you purchase. I love when designers make nice boxes like this, that you can wear & click to quickly receive your items ! Here is the free gifted dress, suscribe ! I chose to show you the Ruby color (3 colors in the gift pack!). Lovely isn’t it ?